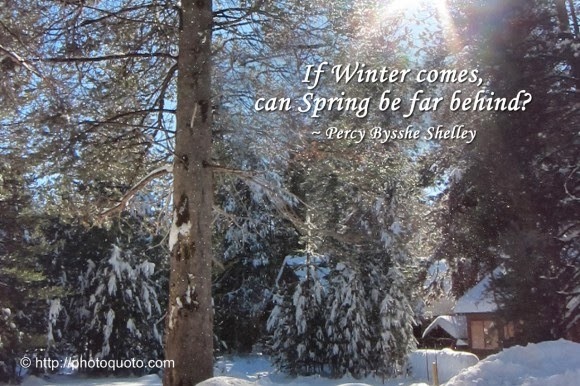 If winter comes can Spring be far behind? This is the last line of Shelley’s famous poem: “Ode to the West Wind.” The poet depicts the terrible effect of the west wind in different spheres. The line is in fact an epitome of optimism. Though for the present the cold winter be the ruler all around, yet the very approach of winter means the impending arrival of the spring season soon after win¬ter. Winter must at last come to an end. It must be followed by the colourful spring which brings colourful flowers and bird’s sweet songs. After all, the circle of seasons must continue moving unhindered. Day is followed by night and night by day. Similarly, in life every period of sorrow and despair has at last to come to end. It is followed by a period of peace, comfort and joy. We must have a firm belief in the goodness of things and have a strong self-confidence. There is no occasion for feeling dismayed. In the famous story, "The last Leaf", for example, Johnsy is sick and is waiting for her death - indeed a cold misfortune of life. But the entire situation twists with an irony in the end when she survives and instead of her the painter Behrman dies who was in fact her savior. The state of the character somehow signifies the fact that if an evil situation has befallen in one's life, the good news that is to be followed is not far behind. Thus, we must rest assured that our sorrows, if any, are short-lived and a period of joy awaits us. Such thinking will always maintain our equipoise and peace of mind.